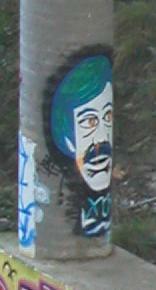 I still haven't quite figured out why someone chose to tag a pillar with Larry Wall's face. I'll start worrying about an incipient East Side geek gang war if I see Guido, Bjarne, or James Gosling tags. I think that is Sonny Bono. Huh. I don't know what's scarier, the thought of crazed perl hackers tagging poles, or SONNY BONO supporters out representin'. Is it maybe graffiti artists for the Sonny Bono copyright act? They big behind a 95 year exclusive license to their work. Throw up a camel somewhere or a pleasant steamy beverage.